So few people got to meet our daughter, Rory. It was such a shocking surprise that my family wasn’t even there on the day of our girls' birth day. But, I didn’t want people to miss out on my amazing daughter and promised to write her story, but couldn’t bring myself to do it until now. I knew my daughter long before she was born. I saw her pug nose and adorable profile on ultrasounds, her dainty fingers waving at us, she always managed to stick a foot or elbow in the picture when we were trying to look at her sisters. I sang to her and talked to her while she jumped around and kicked me in the side. I laughed as I tried to sleep on my side and she used the mattress as her jumping board. She was the first one I felt move long before her sisters got in the mix. She bounced back and forth between her sisters, the middle child who I always thought of as the big protective sister. We didn’t know we were having triplets until almost the end of the first trimester. 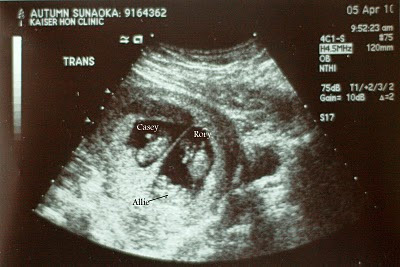 We had several ultrasounds, more than the norm, but we just looked at the two sacs never thinking one sac could have two babies in it. I don’t know who we were seeing, Allison or Rory, but I suspect that they were taking turns being the star of the day. 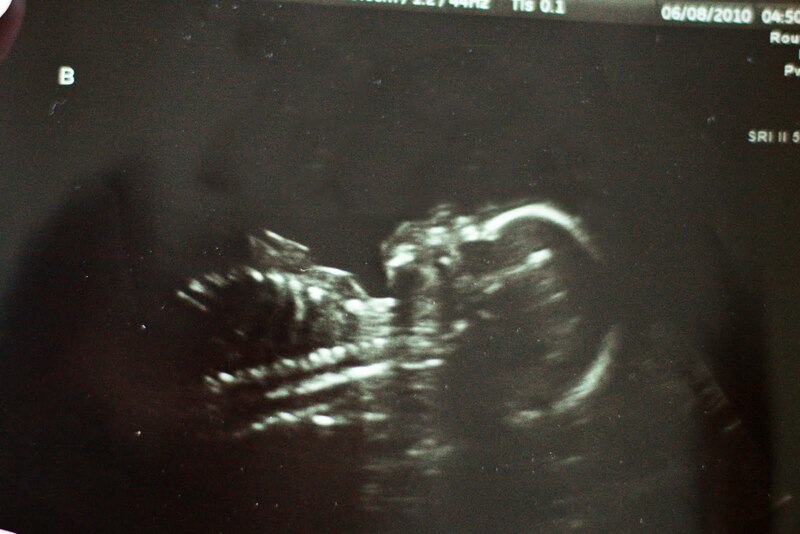 It was the 10 week ultrasound that the tech gasped “I’m seeing three babies” and turned the monitor for us to see. There were three little tiny babies, they looked like chubby gummy bears with short, little arms and legs. Allie and Casey were still but Baby B was my lil Mexican jumping bean. Despite the shock of just learning we had triplets, I broke out into laughter as I saw my baby moving for the first time. It was amazing. We were immediately sent to see a doctor for our high risk pregnancy, Dr. O. He immediately recognized that Rory and Allison were sharing a placenta and Allison was measuring behind in size. We were very concerned about Twin To Twin Transfusion Syndrome, a complication affecting identical twins sharing a placenta that is usually fatal for both babies. The girls needed to learn to share oxygen and nutrients equally and even though Allison was always clearly the smallest baby, Rory shared with her sister. TTTS never developed. At the 12 week ultrasound, the doc measured the fluid at the back of the babies’ necks. Rory’s NT measurements was high and he couldn’t measure Allie because she was too squished for a good view. High NT scores, or excess fluid at the back of the neck, can indicate chromosomal disorders or heart problems. Usually, amnio tests are scheduled but this was too risky for triplet pregnancies. I started to worry. If it was a chromosomal disorder, identical twins Rory and Allison would both have it. We could do nothing but wait, and still, TTTS was our biggest concern. Each doctor visit presented a different problem with the girls, but we kept overcoming through it all. In June, at five months pregnant, we hit one that we couldn’t knock down. A scan of the girls hearts showed some abnormalities with Rory’s heart and we were sent to a cardiologist, Mr. S. We were so confident walking into that appt. We felt we could deal with whatever Rory had. A lot of children have holes in their hearts that close themselves, maybe she might need surgery, maybe we would have to keep Rory from playing active sports. After a 2 hr scan of all the girls, the cardiologist asked us to step into another room. He sat down and laid out exactly what was wrong with Rory and we silently listened in shock. I remember just trying to memorize every detail of what he said as he described the flow of blood through the human heart and body. My brain was working overtime recording each term he used, each piece of info he said. Blood enters the right side of the heart, flows to the lungs and back to the left side of the heart which pumps it to the entire body. I grasped that he was telling us that the left side of Rory’s heart was enlarged and scarred, that most concerning, the aortic valve where blood leaves the left side of the heart to oxygenate the entire body…that valve seemed to be completely closed. I heard the term “aortic atresia.” Dr. S. kept talking. He started to outline what would happen to Rory. 1. She would pass away in the next few months before she was born. 2. She would pass away right after birth. I sat there numb…and he turned to other things about her heart when I realized that there was no option #3. He said that there was fluid around her heart indicating that my little bundle of joy at 5 months had already started to experience cardiac failure. It hit me that my baby wasn’t just going to die, but she might have already started. I remember apologizing “I’m sorry, I think I’m going to cry.” And then I lost it, wailing in that tiny little room. I felt so bad for Dr. S. who became a regular part of our life journey from that step forward. That was the first crack in my heart. My heart started breaking that day. I thought I had composed myself until I felt her kick. At that point, she was the only one I had felt move and she moved all the time. She was alive. She was having a party in there. My poor little girl was living it up and she didn’t know what lay ahead for her. She didn’t know that her heart was giving out on her. She was so full of life. Scott and I went home and silenced our phones, just sitting on the couch together holding hands. I never knew when we would have an ultrasound only to find that her heart had already stopped. Scott hadn’t felt them kick yet, so we sat there with his hands on my belly. I told him “you have to feel her kick. You just have to before …” and I wouldn’t finish the sentence. Congenital Heart Defects affect 1 out of 100 babies born. Some are mild and self-resolve. Most of the time it is genetic, but for some unknown reason, a heart defect can occur randomly. The leaflets in Rory’s aortic valve were fused and did not let blood flow through. Blood flow to the outside of the heart was diminished and scar tissue webbed across the outside of the muscle constricting it’s contractions. The pressure actually forced blood to flow backwards out of the left side and the left half of the heart was becoming enlarged and beat out of rhythm. I had to ask, how could my baby be alive. In the uterus, her little body was saved. She got her oxygen from me, not having to send blood to her lungs, and her right side of her heart was sending that oxygenated blood to the entire body. She was growing on half a heart. He said as she continued to grow, the stress it placed on the heart could be too much and she would pass away in utero. If she made it to birth, there is a hole that connects the blood flow from both sides of the heart. The hole closes after birth, and Rory would pass away. There have been attempts to open heart valves while the baby is still in utero and it has had some success. But it was not an option for us because it resulted in infant death more often than success. We couldn’t risk her sisters. There’s also a three-surgery treatment during the first year of life but we would have to travel to San Diego while I was still 5 or 6 months pregnant and be prepared to stay there for at least a year. Our cardiologist presented our case to San Diego doctors while Scott and I struggled to conceptualize how this journey would work. Where would we live? Who could we stay with? Could I go up by myself at first so Scott could keep working? How were we going to take care of the other two girls while Rory was in the hospital? And then our cardiologist broke the news to us. Surgery on a newborn baby heart needs a big enough heart. Rory, as a triplet, would be born a preemie by nature. The doctors believed she wouldn’t be physically big enough and as a preemie, wouldn’t survive the trauma of the surgery. The night before the doctor’s conferred, we had simply prayed that there would be a clear answer. And we now had one. We couldn’t save our daughter. We had rejoiced so much that we were being blessed with three girls. But being a triplet ruled out what few options Rory had. They told us we could stay here in Hawaii with our support system, and offer comfort care when Rory was born. Making her happy and comfortable, giving us time to be with her until she passed away. Scott and I asked ourselves all the time “If we knew where this journey of parenthood was taking us, would we still have have chosen to take that first step?" We both adamantly agreed without hesitation. If the only time we had with her was when I was still carrying her, we would cherish every day we had. I didn’t even know how to begin to prepare for their arrival because I knew I would have to say good-bye to her. So we lived for the present. I sang to my girls, I wept as we listened to our favorite worship songs “Amazed,” “One Thing,” If I was awoken in the middle of the night by Rory kicking me, I stayed awake and smiled, enjoying the evidence of my rowdy daughter. And I tried not to think about what lay ahead for us. This is just the back story of Rory's heart. Her story is just so beautiful, there's so much I want to share. I'd like to tell you next time about Rory's heart for her sisters and how we had to say hello and goodbye to her in one breath. I love you so much, Rory. You were woven together with joy. beautiful. honest writing kea'o. your guardian angel is sitting on the lap of the ALMIGHTY FATHER. you are so lucky He chose you and scott to love her. While I'm saddened as well, this is absolutely heartbreaking. My fond memories of Rory are kind of in a three hour span while yours stretches on for months. You are a wonderful mother. Sonya and Connie- thank you for your sweet words and follow our lives. It brings us comfort to feel surrounded by such love.